The firm of Wormser Brother was located on the corner of California and Front Streets in San Francisco and listed as importers and jobbers of wines and liquors. Started sometime in 1856 Isaac Wormser, who was living in Germany, was the president of the company and his brother Lewis was the manager. In 1864 Lewis left San Francisco and his brother Simon took over management of the company. In October of 1867, during Simon’s management of the firm, they trademarked the “Golden Sheaf” brand of whiskey. 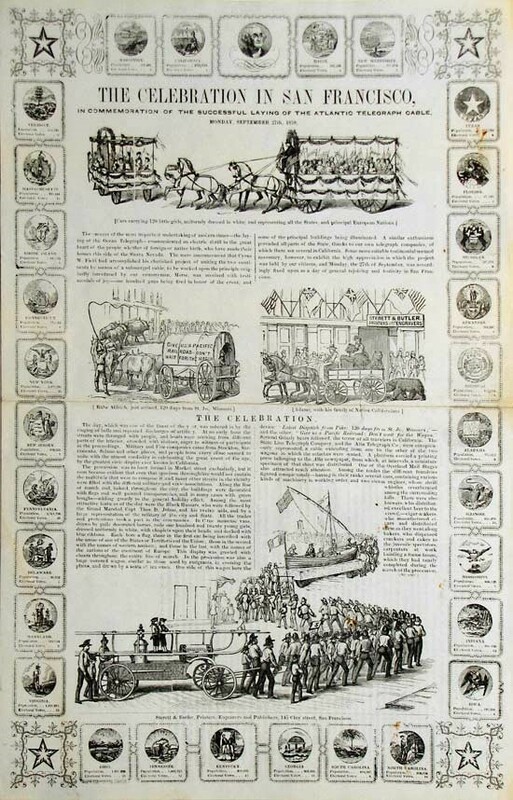 By 1872 the Wormser Bros. business was sold to the firm of Braeg Frank and Dallemand. 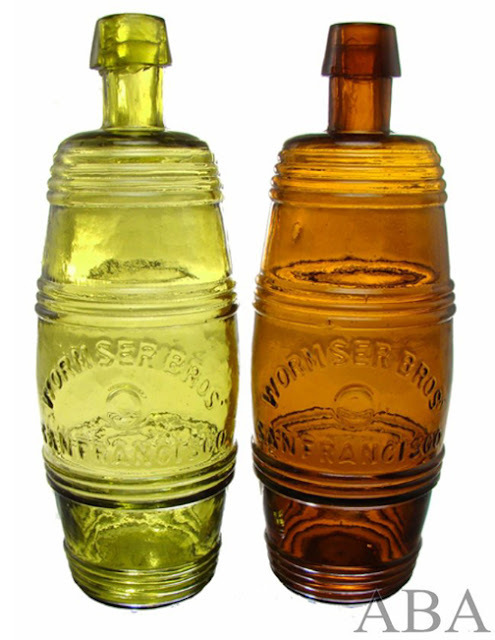 The Wormser Brothers produced some of the more desirable western bottles while they were in business in San Francisco. The earliest glass container from the Wormser firm is the large whiskey flask horizontally embossed WORMSER BROS. SAN FRANCISCO. The Wormser flask is considered very rare with possibly 8 to 12 examples in private collections. Several of these early containers seem to have poor quality glass with annealing checks and other manufacture related problems. It is not known if this bottle was blown in a San Francisco glass house or manufactured in the east and distributed in the west. 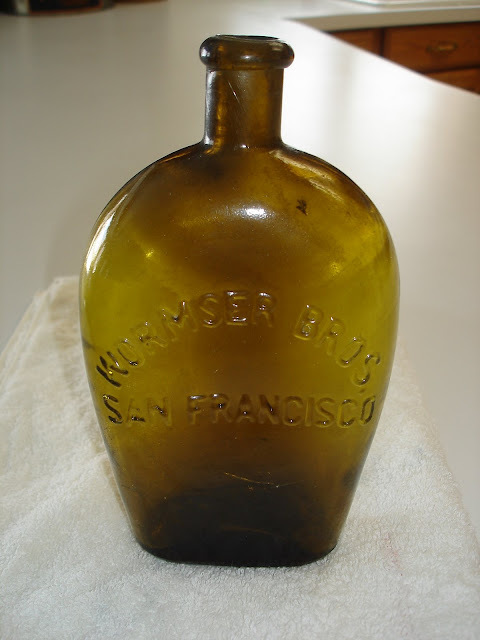 It is believed the barrel shaped bottle with an applied tapered top and a smooth base embossed WORMSER BROS. SAN FRANCISCO was produced for a very short period of time, possibly in 1869 only. 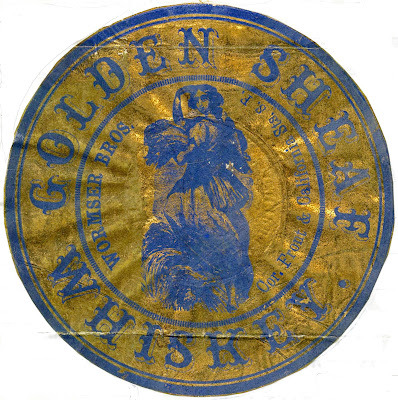 Although I could not find any advertisements to confirm what these bottles contained, Western collectors believe this container held a whiskey bitters product. This barrel shaped bottle comes in various shades of amber from light yellow to darker brown amber. Most examples show very little crudity but a couple examples that I have observed have some pretty good whittle to the glass. It is thought that there are between 25 and 30 of the Wormser Bros. barrels in collections at the present time. 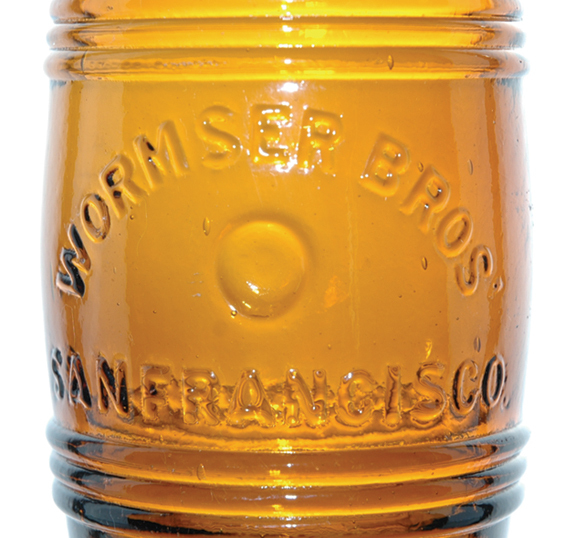 Years ago, in the Virginia City area, several examples of the Wormser barrel were recovered from a large bottle digging excavation. ﻿﻿﻿﻿﻿﻿﻿﻿﻿The last bottle produced by the Wormser Bros. is the vertically embossed flask. These bottles were more than likely manufactured post 1869. They come in colors ranging from dark chocolate to green and are the most common of the Wormser bottles. Back in the fall of 2001 I obtained permission to metal detect and dig a fantastic property. This camp produced many 1850s belt clasps and other metallic artifacts such as this suspender buckle. I was familiar with the buckle's 1856 Patent date but not with this elaborate embossing. Like it was yesterday I clearly remember gridding out a slope backwards through four foot tall poison oak that was below a large camp. The camp was infested with square nails up top and most of the better targets were pitched down the hill where the poison oak happened to be. I spent close to four hours looking for the mate to this buckle with no avail. I never recovered the mate but did get a few hits from items such as a brass frame from a 1/6th plate image, brass shoe tips and a camphene or whale oil lamp burner that I thought were the buckle. I managed to bring the "poison" home to my wife after immersing myself in the patch and I was in the dog house for quite some time after that. That poison was a beautiful green and just starting to turn red. 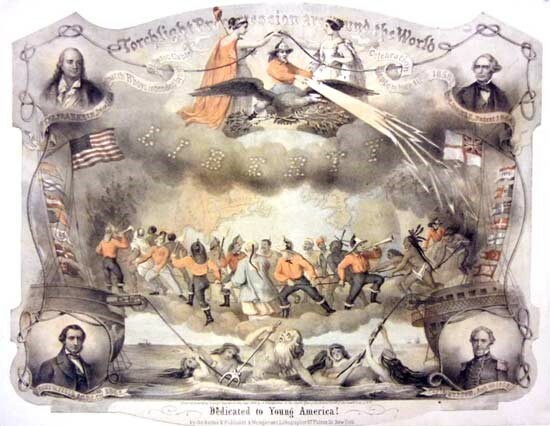 I had a suspicion 15 years ago or so after a few hours of online research what the crossed U.S. and British Naval flag meant. Since that time I realized I really should do some research and see what I could come up with and share my findings with fellow history enthusiasts. I decided to try and find a western connection to the eastern event first for appeal and.... EUREKA! 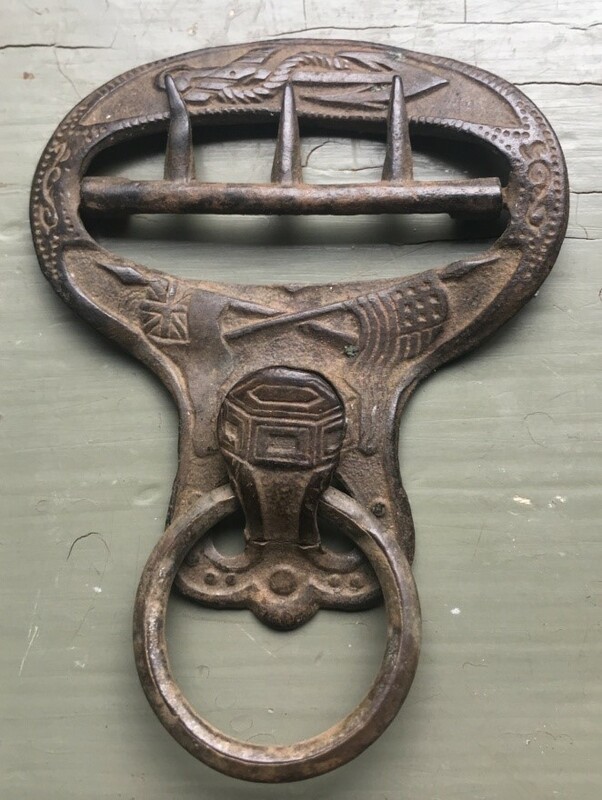 This buckle dates from the correct period and I strongly believe it was created for this special event, as we all know, was often done during the mid 19th century. Alfred, James, and Charles Langley were born in Staffordshire, England in the first quarter of the 19th Century and in 1849 followed the world to California in search of gold. Unlike most adventurers, they were unprepared for gold fever, but - being two chemists and an accountant - they were well equipped to treat fevers of another kind. By the time the gold rush slowed to a ramble, the two eldest Langley brothers were ready to move on. Leaving Charles in San Francisco, Alfred and James travelled north with the new wave of gold seekers and wasted no time in opening the first wholesale and retail drugstore in the rapidly growing town of Victoria, British Columbia. Charles remained in San Francisco and was married to Helena who birthed one child, Charles Jr, born in 1857. Following is what I believe to be the timeline of Charles Langley's doings in the wholesale drug business of San Francsico. Charles Langley died on July 26, 1875 at the age of 51. Based on the above timeline and Warren's research, we can safely deduce that the clear "C Langley" variant was blown in 1865 only while the aqua variant was blown after 1869 (but no newer than early 1870s based on empirical analysis). A little more about Langley. My observation relates only to the Langley sarsaparilla, which I believe was produced up to about 1880. 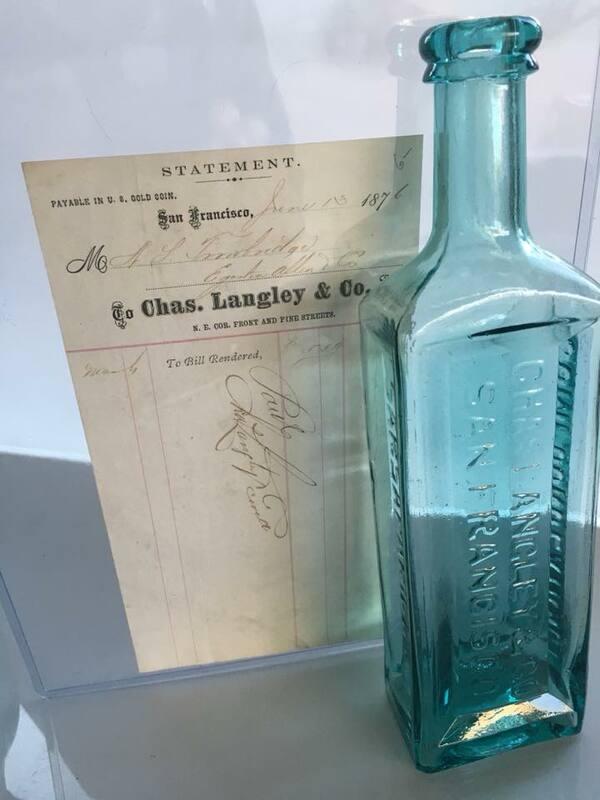 Charles Langley, the Langley brother who stayed in California, may have actually had the sarsaparilla bottles produced but I am not completely convinced. 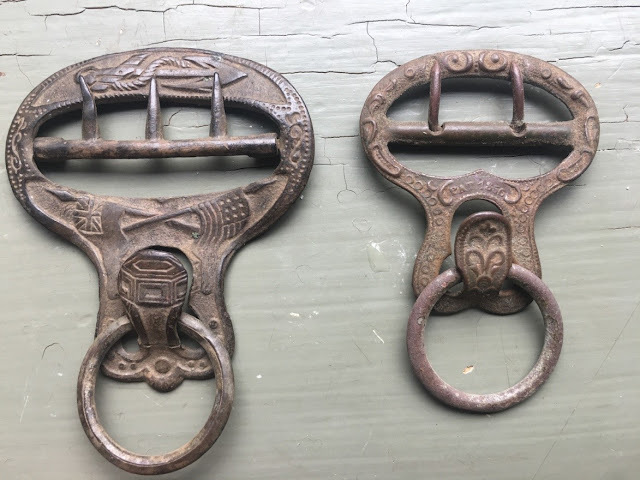 My thinking is based on the relatively few examples found and the fact that the majority of the examples I have seen have a tooled top, generally a feature that came into practice a few years on either side of 1880 in San Francisco (although there are certainly exceptions). Charles Langley died in St. Helena, Napa County, on July 25, 1875. His widow, Melanie Langley, became administrator of his estate and continued the operation of the wholesale drug firm under her husband's name. She relied heavily on the expertise of Henry Michaels who probably actually ran the operation. By May 1880 the firm of Charles Langley & Co. had become Langley & Michaels, reflecting the rising importance of Henry Michaels in the company. The Langley sarsaparilla bottles were probably not made after this date, but the year of its inception is a little more difficult to pin down.